Alexandra Adams, MD, PhD, is leading a Wisconsin Partnership Program-funded initiative to prevent obesity. 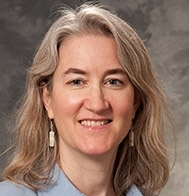 The Department of Family Medicine’s (DFM) Alexandra Adams, MD, PhD, is the principal investigator on a five-year, $7.5 million grant from the Wisconsin Partnership Program’s (WPP) Partnership Education and Research Committee that aims to address the state’s obesity epidemic. Through that grant, which is one facet of the new Wisconsin Obesity Prevention Initiative, Dr. Adams will build strategic alignment among government entities, communities, researchers, advocates, nonprofit organizations and businesses. She’ll also lead a team of faculty and community investigators to develop a childhood obesity surveillance system and create statewide messaging on how daily decisions affect health, and bring together stakeholders from state government. In another facet of the initiative, researchers will test and implement a community-based model for childhood obesity prevention, initially in Marathon and Menominee counties. Brian Christens, PhD, an associate professor in the UW-Madison School of Human Ecology, is leading those efforts. Learn more about the Wisconsin Obesity Prevention Initiative.